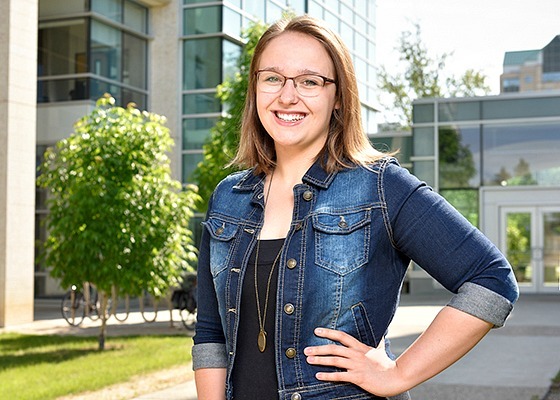 By Greg Campbell Posted: June 8, 2018 11:30 a.m.
Christen Van De Woestyne, who graduates today, is the 1,000th graduate of the Saskatchewan Collaborative Bachelor of Science in Nursing program. Photo: U of R Photography. When it comes to health care, Saskatchewan has always been a land of firsts. In 1951, for the first time in medical history, doctors and medical students in the province successfully treated a cancer patient using cobalt-60 radiation therapy. In 1961, the province introduced Canada’s first universal health care plan. And, in 2011, in collaboration with Saskatchewan Polytechnic, the first classes of the innovative Saskatchewan Collaborative Bachelor of Science in Nursing (SCBScN) program were offered. Since then, the program’s reputation, coupled with the rising need for nursing graduates in the province, has resulted in an ongoing and robust interest from applicants. From the time of the first graduates of the program in 2014, the majority of SCBScN alumni have gone on to fill nursing roles across the province. Today, when Christen Van De Woestyne walks across the Convocation stage she will have officially earned her BScN degree. In the process, she becomes the 1,000 graduate in the program’s history and one of 166 nursing students earning degrees at the 44th annual Spring Convocation, the largest spring ceremony in University history. Van De Woestyne was first attracted to the nursing profession when she and other family members experienced the health care system first hand while caring for her grandfather who suffered from chronic illness late in his life. The SCBScN program is a direct-entry, degree program offered in Regina and Saskatoon with local cohort intakes in Swift Current and North Battleford. According to University of Regina Dean of Nursing, david Gregory, most people underestimate the scale of nursing education in the province. “We are a large scale program,” he says. “There are 690 students coming into nursing in the province each year; 345 are admitted into the SCBScN program. Between the graduates of the SCBScN program and graduates of the College of Nursing at the University of Saskatchewan, we are meeting the staffing needs for registered nurses in the Saskatchewan health care system for the first time in many years." Gregory and Sandra Blevins, Dean of Sask Polytechnic, observe that the collaborative program affords students access to resources that wouldn’t be available if a single institution delivered the program. For example, students can access student support and services both at Sask Polytechnic and the University of Regina. And, it’s clear, the collaborative approach is creating success for students. Graduates of the SCBScN program average five percentage points higher than the national averages attained by Canadian and U.S. graduating students on the NCLEX-RN licensing exams, one measure by which graduates are granted their registered nurse license. Van De Woestyne takes the wide view about being the 1,000th graduate of the program.